I love Halloween and every year I decorate my house inside and outside. I have a couple of large bins with decorations sitting in our family garage and each year there is a little more to be put away. My husband complains every year as he lifts the boxes up to the top shelf. Soon, he says, there will be no space left, and then we'd have to throw something away for sure. Oh well, I'll be sad when that day comes. But, our garage is pretty large and I am not too worried. Also, my kids are very excited when we put the decorations up every year and that makes me think that Daddy will find more storage space when we need it. 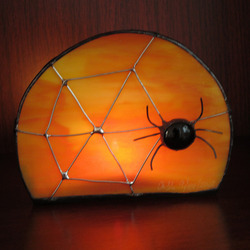 I also make new Halloween-themed stained glass items every year. I keep my favorites around the shop but like to add more variety. This year I was inspired by a sheet of gorgeous orange glass with yellow streaks. I made a couple of Falling Leaf night lights out of it, but felt it had so much more potential! After thinking about it for quite a while I decided that a bright orange moon would look good. So, I cut a crescent piece out. 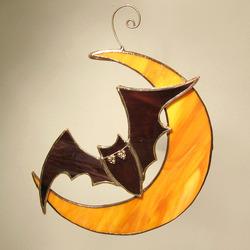 I decorated that crescent with a graceful bat made of thick dark purple glass. I used the overlay method that is very popular when I use it in my cloud sun catchers. The bat came out just like I wanted it, light and fluid, I think I was able to make it really fly. When I was done with the sun catcher, the semi-circle piece of orange glass that came out of the middle of the crescent has caught my eye. It was definitely not a scrap piece, it was telling me I had to make it into something right away. But what? A pumpkin? No, it was too dramatically-looking to be dressed into a green cap of pumpkin vine. A moon! A full moon this time, a huge, sinister rising moon! Just add a spider and it is ready to serve!